1. Cast iron: it is ideal for mounded parts, like car engine blocks. 2. Wrought iron: it is suitable for use in outdoor furniture, porch railings and other decorations. 3. Steel: it is an excellent material for thousands of different uses. 4. Stainless steel: it is an ideal material for motor vehicle parts, hospital equipment and food preparation tools and utensils. Iron ore crushing machine is the major crushing equipment used in a stationary iron ore crushing and screening plant. Iron ore crushing machine includes primary crusher, secondary ore crusher, tertiary ore crusher etc. Jaw crusher takes as primary crusher, impact crusher, cone crusher usually applied as secondary crushing machine. Sand making machine, vertical shaft impact crusher can be used for producing final iron ore products. As a professional crusher manufacturer and exporter, ZENT can supply you most models of iron ore crushing machines with good quality, high crushing capacity, low energy consumption, environment friendly etc. In iron ore process, the crushing and screening process will directly affect the production of final products of iron ore. In order to gets the fineness iron ore size before entering into ore grinding equipments such as ball mill, vertical mill, fine mill, trapezium mill etc; we usually take use of jaw crusher, cone crusher or vsi crusher in pre-grinding stage. In coarse crushing process, jaw crusher and impact crusher are key crushing equipments, and in fine crushing stage sand making machine or fine crushers are suitable. 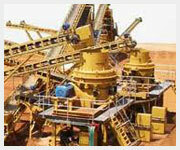 If the iron ore materials are wet and sticky, there are some troubles when it comes to crushing and screening stages. In order to provide this problem, water-flush processing equipments are important. In the other hand, once primary crushing machine and secondary crusher equipments take a long time to maintain. In this process, ZENT VSI5X crusher is the best choice to replace of cone crushers or traditional crushing machines. ZENT can supply you all the crushing processing equipments such as jaw ore crusher, impact crusher, cone crusher, hammer crusher, mobile crusher etc.